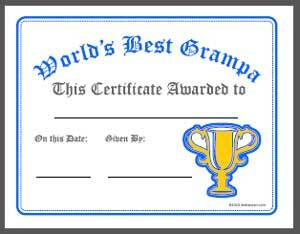 Grandfather will be proud and pleased on Father's Day, his birthday or any day at all when you give him a personalized World's Best Grampa certificate decorated with a manly blue border and special gold trophy design. All you need to add to this printable award are your family details and the date. Each Adobe PDF best grandma certificate is designed to print on US letter size paper (8.5" x 11") in landscape mode, or can be resized to fit your paper or design ideas.